Do you believe in love at first sight? Maybe yes, maybe not, but the first time you are in Verona, you will taste it, and believe it or not, you will feel it. It is a city that celebrates Shakespeare love with centuries and you will find it in every stone, in every cookie smell, in every nuance, and in every song of the birds. You will smell the taste of love and tragedy and sense the charm and the elegance between the ancient and the modern elements. Verona is one of the seven provincial capitals of the region and the second largest city municipality I the region. Also is the one of the main tourist destinations in Northern Italy. Verona is declared a World Heritage Site by UNESCO, because of the architecture and urban structure. Once you are in Verona you will notice many historical monuments and structures that are the main sights of this city. It is famous for the Roman amphitheater and the Ponte di Pietra, that is another Roman landmark. You should also visit the Basilica of San Zeno Maggiore, the church from the Roman time, and all the other cathedrals from that time as Basilica of San Lorenzo, Santa Maria Antica, and Sant’ Anastasia. The most famous plays from Shakespeare, are also set in Verona, like Romeo and Juliet and the Two Gentlemen of Verona,that are the main reason to lure many visitors to Verona and the surrounding cities. You will have an enjoyable day in the romantic and enchanting city of Verona. Your guide will show you the famous balcony of Romeo and Juliet, where Romeo express his wide heart to his beloved Juliet of Capuleti. The visit will continue to the main masterpieces of Verona, where you will see the famous Roman amphitheater and more of the Roman churches, and you will have time to enjoy in the marvelous Piazza Mercato and explore the magnificently architectural monuments. Later you can have a lunch in the lovely Verona’s restaurants and after that, you will take a ride to the small enchanting village of Sirmione. There you will have an exclusive chance to take a boat tour on the wonderful Lake Garda. 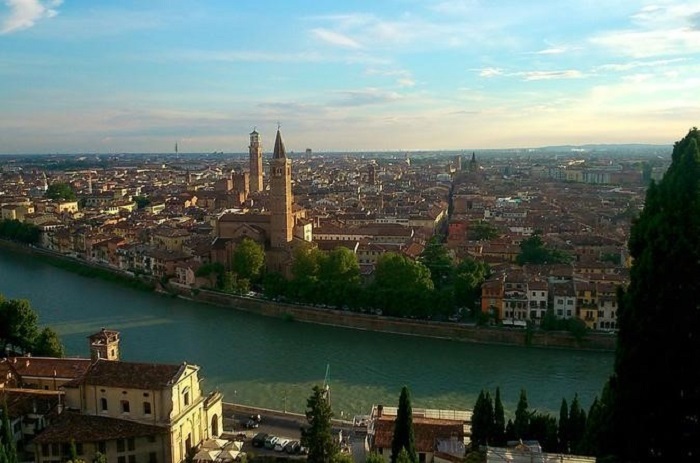 Early in the morning, you will take a ride from Milan by a professional coach and head to Verona, also known as the “Little Rome” because of the number of theatres, monuments, and amphitheaters. When you come to Verona, you will visit the stunning historical places like the Roman Arena, Ponte Pietra and the enchanting buildings on Piazza Erbe. The trip will bring you to the house of Capulet and then you will make your way to Lake Garda. You will have a wonderful time at this lovely lake, where you will enjoy an amazing boat trip to the gorgeous village Sirmione. You will across the relaxing countryside dotted with castles and vineyards, and then you will take a boat to cross the lake, to reach the elegant village of Desenzano. 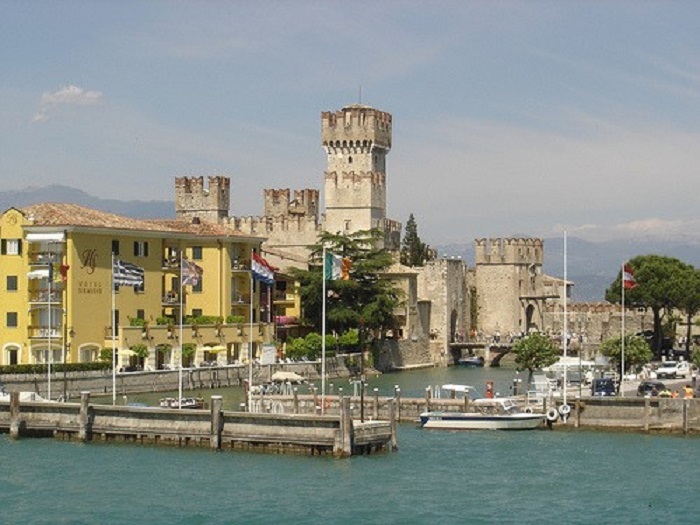 In Desenzano you will explore the historical center, the glitzy buildings and different kind of shops. 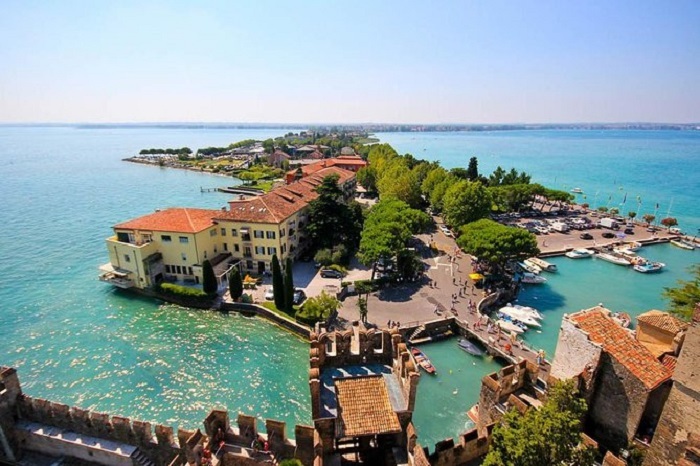 You will start the trip from Milan in an air-conditioned minivan that will take you along a small fortified village at the end of a narrow peninsula called Sirmione. Here you can reach an amazing panoramic view on the eastern and western shores of the Lake Garda. Your guide will give you a full information about the beauty of this glitzy village, about the main historical sights such as Maria Callas villa, Grottoes of Catullo and a lovely castle, Castello Scaligero, built by the Scaliger family to protect the lower part of the lake. This castle represents a unique masterpiece of the lake. In the next hour, you can enjoy a tasty lunch on your own charge and then continue the trip to the romantic city of Verona. Once you are in Verona, you can enjoy the smell of love that the Shakespeare story of Romeo and Juliet brings you. You will explore the most attractive places as the Piazza Bra, the Roman Arena and Piazza dellle Erbe. This is your unique chance to see the world-wide famous Juliet’s balcony and enjoy the inspiring love of all time. In the late afternoon, you will take the coach trip to Milan. Discover the romance of the historical Shakespeare’s city Verona on a one day trip from Milan. 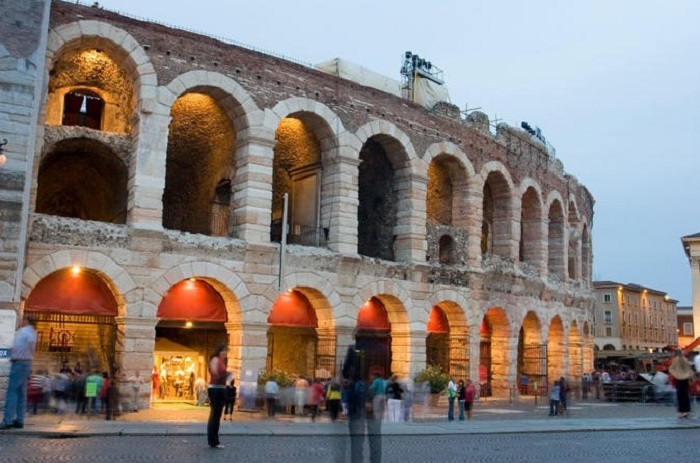 Once you are in Verona you can check out the ancient Roman Arena and amphitheater in Piazza Bra. You can also pay homage to the playwright at Juliet’s House and see the most popular love balcony. Visit the amazing streets of Verona’s historical center and travel to the medieval village of Sirmione. Take a boat cruise to Lake Garda and enjoy the glamorous landscapes. Use your time in Sirmione to see the exclusive monuments of the village as the castle, Rocca Scagliera di Sirmione or visit the Roman villa. Return back to Milan in the late afternoon. It is a unique chance to see the love balcony of Juliet, where Romeo hails Juliet and she speaks to him from the balcony. It is the most famous Shakespear play and one of the several plays that are set in this city. The house is located on the Via Cappello and is an important attraction that everyone should visit. Inside the house, you will notice a selection of informative displays about the building. Located in the middle of a town center, Verona has its own version of the Colloseum in Rome, that is just as spectacular and better preserved. This is the main landmark of the city and a triumph of Roman engineering. This construction is a thousand years old but the structure is still in good condition. You can visit inside the Arena and admire the furthermore, concerts, architecture and musical shows that are still held here. Constructed in 1354, this castle is the greatest achievement of engineering for the Scaliger dynasty. You will see the imposing and features gatehouse and also the museum dedicated to the history of the castle. The Castle Vecchio is connected with the bridge decorated in the same style as the walls of the castle. The Bridge of Castle Vecchio is made from the red brick that makes it stand out against the landscape of the city. The bridge provides the enchanting views of the river where you can capture the most glamorous photos. Known as the fictional place of the marriage of Romeo and Juliet, this is the most attractive sanctuary in Verona. It is located on the west side of the River Adige and is famous for an astonishing architecture. The basilica has floor decorated with grey and peach tiles and the front façade that has a large circular window and marvelous wooden door. In the heart of the historic center of Verona lies the diamond-shaped piazza that is the most favorite point of the city. In the Roman times, the piazza was the main forum for the settlement, and there are plenty of attractive buildings that line here including the Palazzo Maffeia, Case dei Giudici, and the Torre Lamberti. Piazza Bra, known as the most popular tourist area of the city is the largest piazza in Verona. It owns the amount of historical monuments, buildings, and amenities. The main sight of the Piazza Bra is the Arena di Verona, the most popular architectural Roman treasure. One of the gracious buildings here are Gran Guardia and the Palazzo Beriberi, and along the piazza, you will meet many different shops and residential structures, that have beautifully decorated balconies. Dedicated to the Virgin Mary, the Cathedral of Verona is one of the oldest religious buildings. The front façade features a similar composition as the Basilica of San Zeno, but contains more decoration, nice colored artwork and stained glass windows. The main altar contains a fresco depicting, and in the main chapels, you can see more Renaissance frescos. The most famous and tallest tower in Verona is situated on the Piazza Delle Erbe. It is originally started in 1100, but the final work has been done in 15-th century. You can notice a different time period in the several different sections of the tower construction. Everyone who would like to enjoy a different sightseeing of Verona, can climb to the top and take the city on their hands. This piazza is even more popular than the most attractive Piazza delle Erbe, and have many historical structures and buildings just as the Loggia del Consiglio, the Case della Pieta and the Palazzo del Capitano. Each building owns different style ornaments and contrast the different time periods. The piazza offers original Italian restaurants and cafes and is often a place where you can hear good music performances. With the surface area of 369 squared km and water volume of 50 km cubed it is one of the largest lakes in Italy and one of the most popular holiday location. Once you are on the lake, don’t forget to take a boat cruise and enjoy the glorious scenery or visiting the charming villages on its shores like Sermione, Bardolino or Desenzano.